Chang'e-4's low-frequency radio astronomical observation on the moon's far side will fill gaps in astronomical observation. BEIJING, Jan. 3 (Xinhua) -- China's Chang'e-4 lunar probe has made the first-ever soft landing on the far side of the moon. Experts believe that the precise landing will help prepare the country for its following lunar exploration and future expeditions to other planets. BEIJING, Jan. 3 (Xinhua) -- Over about 12 dramatic minutes, China's Chang'e-4 probe descended and softly touched down on a crater on the far side of the moon on Thursday. Wu Weiren, chief designer of China's lunar exploration program, said Chang'e-3 landed on the Sinus Iridum, or the Bay of Rainbows, on the moon's near side, which is as flat as the north China plain, while the landing site of Chang'e-4 is as rugged as the high mountains and lofty hills of southwest China's Sichuan Province. Chinese space experts chose the Von Karman Crater in the South Pole-Aitken Basin as the landing site of Chang'e-4. The area available for the landing is only one eighth of that for Chang'e-3, and is surrounded by mountains as high as 10 km. Unlike the parabolic curve of Chang'e-3's descent trajectory, Chang'e-4 made an almost vertical landing, said Wu. "It was a great challenge with the short time, high difficulty and risks," Wu said. The whole process was automatic with no intervention from ground control, but the relay satellite transmitted images of the landing process back to Earth, he said. "We chose a vertical descent strategy to avoid the influence of the mountains on the flight track," said Zhang He, executive director of the Chang'e-4 probe project, from the China Academy of Space Technology. 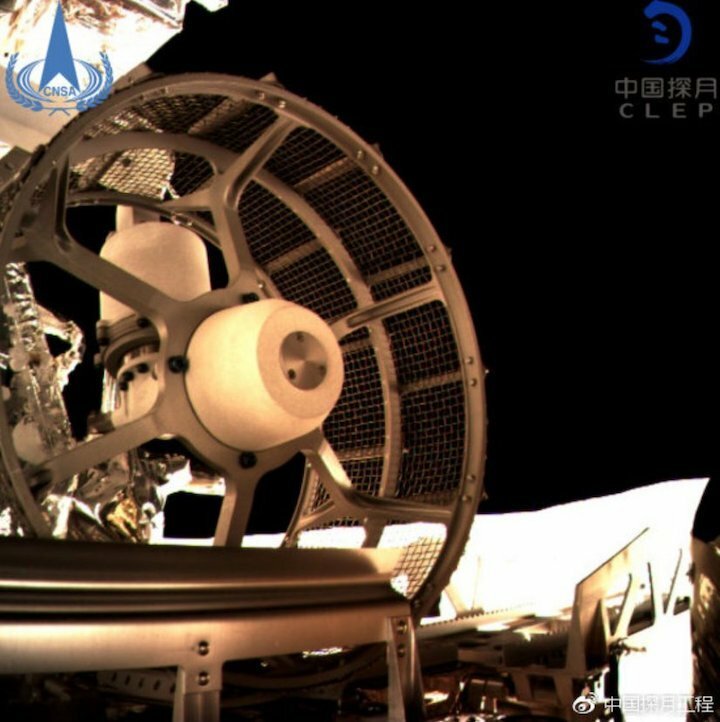 Li Fei, one of the designers of the lander, said when the process began, an engine was ignited to lower the craft's relative velocity from 1.7 km per second to close to zero, and the probe's attitude was adjusted to face the moon and descend vertically. 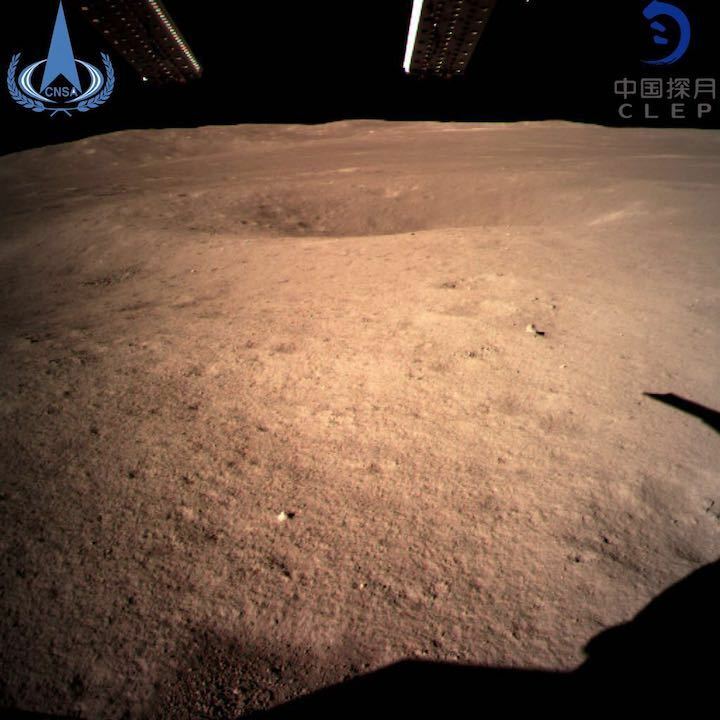 When it descended to an altitude of about 2 km, its cameras took pictures of the lunar surface so the probe could identify large obstacles such as rocks or craters, said Wu Xueying, deputy chief designer of the Chang'e-4 probe. 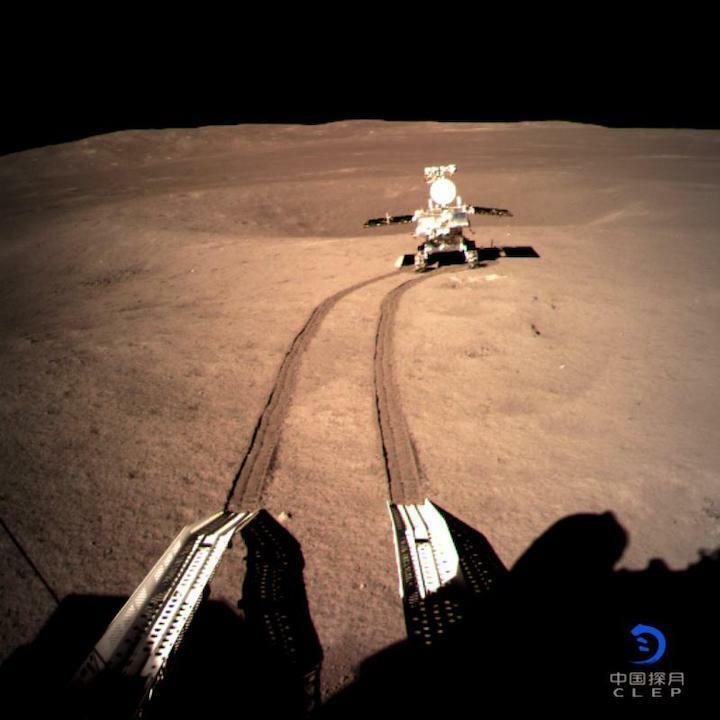 At 100 meters above the surface, it hovered to identify smaller obstacles and measure the slopes on the lunar surface, Wu said. After calculation, the probe found the safest site, and continued its descent. When it was 2 meters above the surface, the engine stopped, and the spacecraft landed with four legs cushioning against the shock. The moon is what scientists call " tidally locked " which means the same side always faces us, while another side always faces away, Loeb said. When Earth views a darkened new moon, the far side is lit. When there's a full moon in our sky, the far side is dark. Every semester, Purdue University lunar and planetary scientist Jay Melosh demonstrates how the far side gets light using a bright light as the sun and students playing the roles of the moon and the Earth. But students still get it wrong on the midterm, calling it the dark side. Melosh traces the myth back to a Walt Disney television special in 1955 that talked about it always being dark on the other side of the moon and futuristic astronauts dropping flares. The term dark side really took off in 1973 with the Pink Floyd's mesmerizing album "The Dark Side of the Moon." While China is the first to land a spacecraft on the far side, there have been plenty of detailed photographs taken by orbiting spacecraft. The first grainy pictures came from a former Soviet Union craft in 1959. NASA's Apollo 8 astronauts saw it first when they orbited the moon 50 years ago. 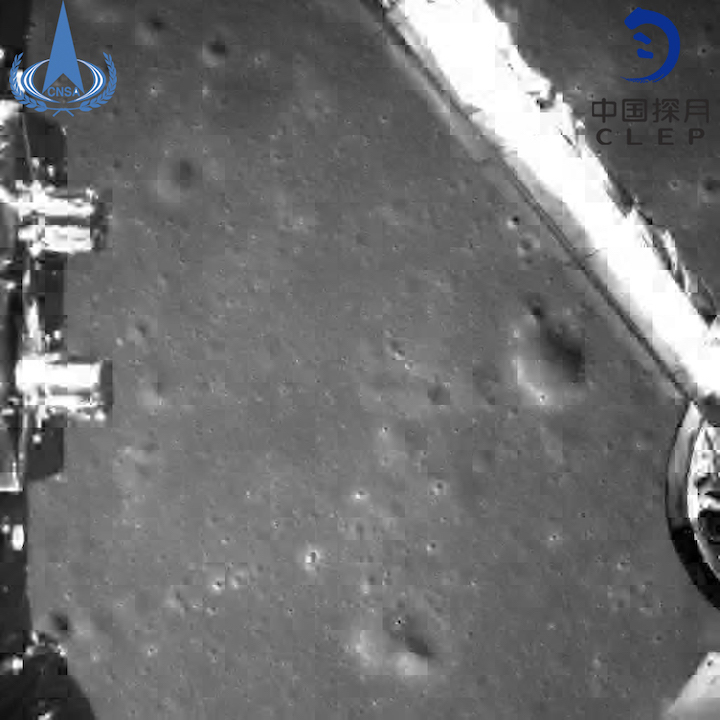 Chinese state media and internet users are celebrating the Chang'e-4 probe landing on the far side of the Moon, calling it "a major milestone in space exploration", and comparing it favourably to past American and Russian missions. State broadcaster China Central Television (CCTV) aired video simulations of the landing a couple of hours after it took place. 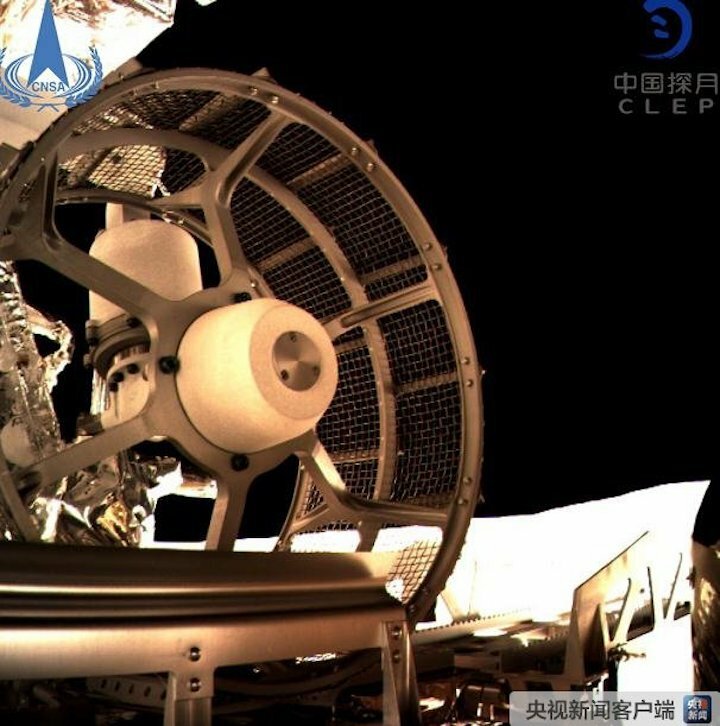 Close-up pictures taken by the probe and relayed by the Queqiao (Magpie Bridge) satellite "lifted the ancient mysterious veil" of the far side, the broadcaster said. The mission was cast very much as an achievement for the world, not just China. "The mission achieved humanity's first soft landing of a probe and the first relay communication between the Moon and Earth, opening a new chapter in human lunar exploration," CCTV said. The nationalist Global Times newspaper contrasted the "open and cooperative" nature of China's space mission with the US' Apollo and Soviet Union's lunar missions, which it described as driven by a "struggle for hegemony". 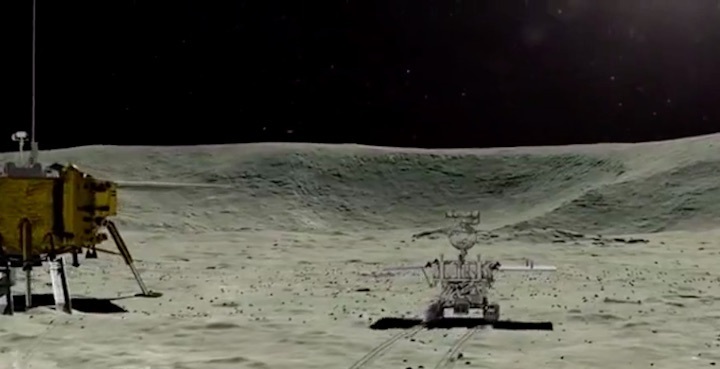 China's lunar exploration mission "has always harboured the dream of a human community of shared destiny", it said. "Since the start of our lunar exploration mission, all of our images and data have been presented openly to the international community and used by scientists worldwide," it added. News of the landing also generated some speculation internationally on Twitter, after some journalists and scientists noticed that two state media outlets - the China Daily newspaper and the broadcaster CGTN - deleted tweets confirming that the landing had been a success. The reason for the deletions is unclear but both outlets later released new tweets on the story, similar to the deleted ones, with only the time of the landing added. Twitter is largely blocked in China but the topic was also discussed by a few Chinese users on Sina Weibo, China's equivalent of Twitter, which is tightly moderated. "China Daily and CGTN are both reporting the success of Chang'e-4 on Twitter. But there is no news at all from Xinhua back home," one user noted. Most users, however - numbering in the millions - expressed congratulations and pride in their country's achievements on Sina Weibo. On most state news portals, including Jinri Toutiao, Sina, Sohu, The Paper, Global Times and Xinhua, the Moon landing ranked second in popularity after a political story very important to Beijing - President Xi Jinping's New Year speech on Taiwan on 2 January. On Sina Weibo, the hashtag "Chang'e-4 lands on far side of the moon" was also pinned as an alternating top theme for the day on the platform's "hot search" list, along with news of China's new e-commerce law. A number of users strongly criticised Sina Weibo for not giving the landing sole top billing. "Can't this be the top hot search item? Our country is too amazing!" demanded one Weibo user. "Scum Sina! This should be the first hot search item, OK? Great pride. Childhood dream!" said another, popular Weibo post. China’s state news agency, Xinhua, said the probe took a small plant called arabidopsis which is expected to produce the first flower on the moon. Other items included in a mini-biosphere include cotton, rapeseed, potato, fruit fly and yeast. Thursday’s successful touchdown in the unexplored South Pole-Aitken basin, the biggest known impact structure in the solar system, was hailed a major technical feat and is seen as a important step towards China’s wider ambitions in space. Spacecraft have taken pictures of the moon’s far side before, but no lander has ever landed there. The moon’s far side is sometimes known as the dark side, although it is not darker than the near side in any literal sense. It undergoes the same phases of illumination by the Sun as the side facing Earth. But because the moon spins on its axis at exactly the same rate as it orbits Earth, one side remains permanently out of view. It was only in 1959, when the first images of the far side were beamed back by the Soviet Union’s Luna 3, that intriguing differences were revealed. The far side is pockmarked by more craters and appears almost devoid of the seas of solidified lava, known as maria, that form the shadowy shape of a face that we see from Earth. The mission will also conduct the first astronomy observations from the moon’s far side, which is seen as a uniquely attractive site for monitoring radio waves coming from deep space. Astronomers operating Earth-bound radio telescopes have to constantly grapple with electromagnetic interference from human activity: shortwave broadcasting, maritime communication, telephone and television signals. The far side of the moon is shielded from such signals, making it far easier to pick up faint fingerprints left by the Big Bang. The craft is also carrying a mini-greenhouse, which will test how well plants, specifically potatoes and small flowering Arabidopsis plants, related to cabbage, grow on the moon. The lunar far side now has its first set of rover tracks. Last night (Jan. 2), China's robotic Chang'e 4 lander-rover duo pulled off the first-ever soft touchdown on the moon's largely unexplored far side. And today (Jan. 3), the rover rolled onto the gray dirt floor of the 115-mile-wide (186 kilometers) Von Kármán Crater, creeping down twin ramps from a previous position atop the stationary lander. 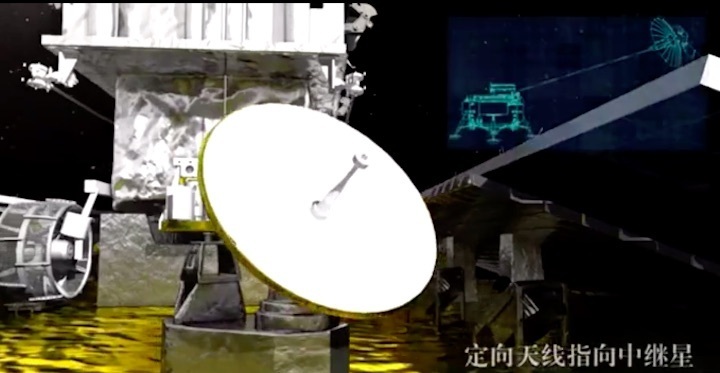 Also today, China revealed the name of the rover: "Yutu 2." This moniker may not be terribly creative, but it makes a lot of sense. The original Yutu rover touched down, along with a lander, on the moon's near side in December of 2013 on the Chang'e 3 mission. And Chang'e 4 was originally designed as a backup for Chang'e 3, so the two missions share a lot of hardware. China's Yutu 2 rover makes the first wheel tracks on the far side of the moon on Jan. 3, 2019, after rolling down from the Chang'e 4 lander. 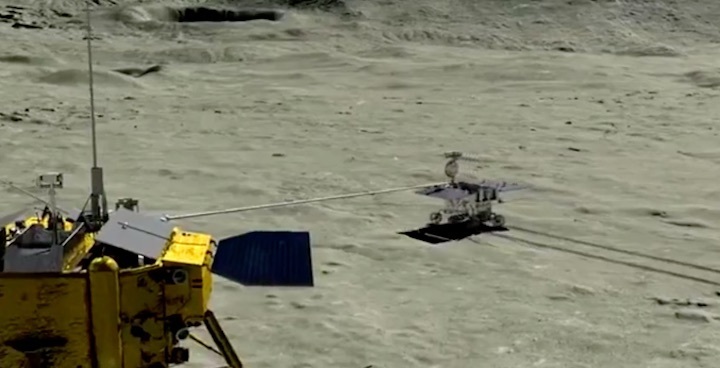 Yutu 2 and its lander companion will conduct the first in-depth science investigations on the far side. The two craft tote four science instruments each, and these will enable the pair to characterize the surface and near subsurface of Von Kármán in great detail. This crater lies within an even larger impact feature, the 1,550-mile-wide (2,500 km) South Pole-Aitken Basin. The lander also carries a biological experiment: a small tin containing silkworm eggs and the seeds of several plant species, including potatoes. Mission team members aim to study how these organisms grow and develop in the low-gravity lunar environment. A close-up of one of Yutu 2's wheels. The lander and Yutu 2 cannot beam their data home to Earth directly, because the moon's far side always faces away from our planet. Indeed, this communication complication is a big reason why the far-side surface had not previously welcomed any functioning spacecraft (though a few probes have crashed there over the years). So, the Chang'e 4 duo will rely on a relay satellite called Queqiao, which China launched to a gravitationally stable point beyond the moon in May 2018. From its vantage point, Queqiao can keep Yutu 2, the lander and Earth all in sight at the same time. Chang'e 4 is the latest step in China's ambitious program of robotic lunar exploration, with the satellite taking its name from a moon goddess in Chinese mythology. (In this mythology, by the way, Yutu is the pet rabbit of Chang'e.) The Chang'e 1 and Chang'e 2 missions sent orbiters to the moon in 2007 and 2010, respectively, and Chang'e 3 aced its near-side touchdown in late 2013. Then, in October 2014, the Chang'e 5T1 mission launched a prototype capsule on an eight-day trip around the moon. The main goal was to help prove out technology required for the Chang'e 5 sample-return mission, which could launch as early as this year. BEIJING, Jan. 4 (Xinhua) -- China's second lunar rover has driven on the far side of the moon, which is expected to bring more scientific discoveries from the alien world. The new rover, named Yutu-2, or literally Jade Rabbit-2, separated from the lander and descended on the lunar surface Thursday night, leaving the first "footprints" on the loose lunar soil, which will be seen for thousands of years as the moon has no wind or rain. 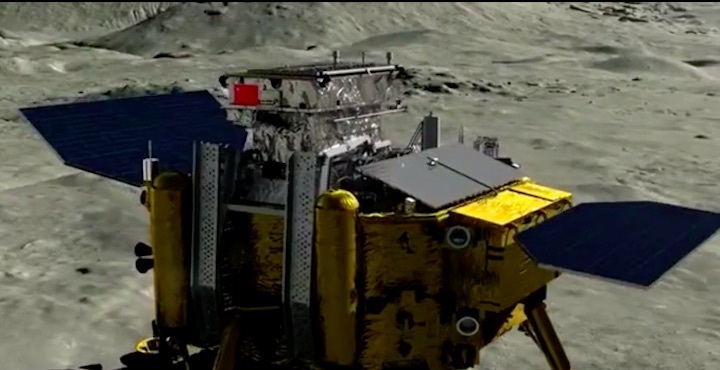 Although the rover of the Chang'e-4 probe looks similar to its predecessor Yutu of the Chang'e-3 probe, Chinese space engineers have made it lighter, smarter, stronger and more reliable. In Chinese folklore, Yutu is the white pet rabbit of Chang'e, the moon goddess who lent her name to the Chinese lunar mission. 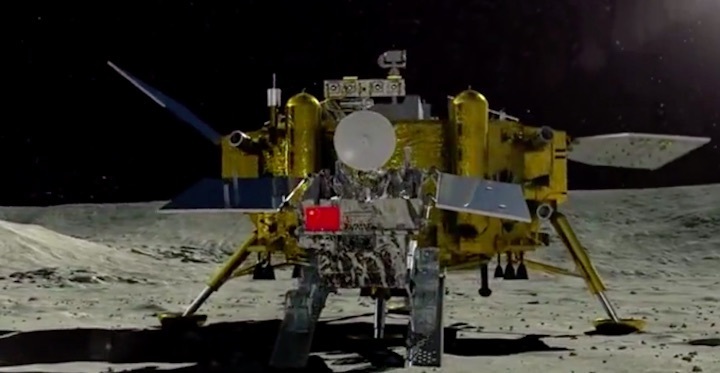 Scientists hope Yutu-2 will travel farther to send more images of the unknown terrain, "listen" to the stories recorded in the ancient lunar rocks, and find more traces of the early history of the moon and the solar system. The 135-kg new rover is 2 kg lighter than its predecessor and is the lightest rover ever sent to the moon, said Jia Yang, deputy chief designer of the Chang'e-4 probe, from the China Academy of Space Technology (CAST). The main reason for the weight reduction is the removal of a robotic arm and its replacement with an instrument developed by Swedish scientists to analyze the radiation environment on the lunar surface, said Jia. 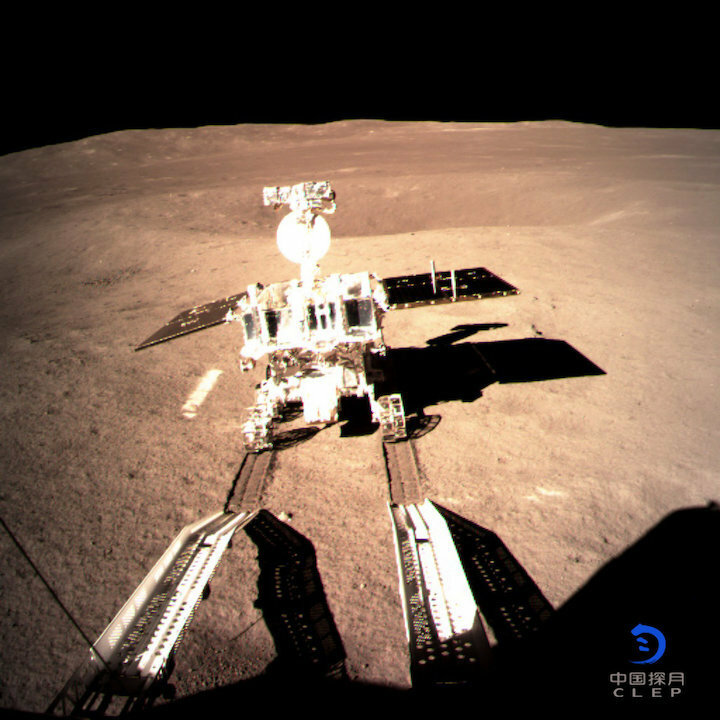 Like Yutu, which landed on the moon at the end of 2013, the new rover carries subsurface penetrating radar to detect the near-surface structure of the moon and an infrared spectrometer to analyze the chemical composition of lunar substances. Two panoramic cameras, like two eyes, can take high-resolution, color images. The rover, with a design life of three months, can cross rocks as high as 20 cm, at a maximum speed of 200 meters per hour. At nighttime on the moon, temperatures can drop to about negative 180 degrees Celsius. 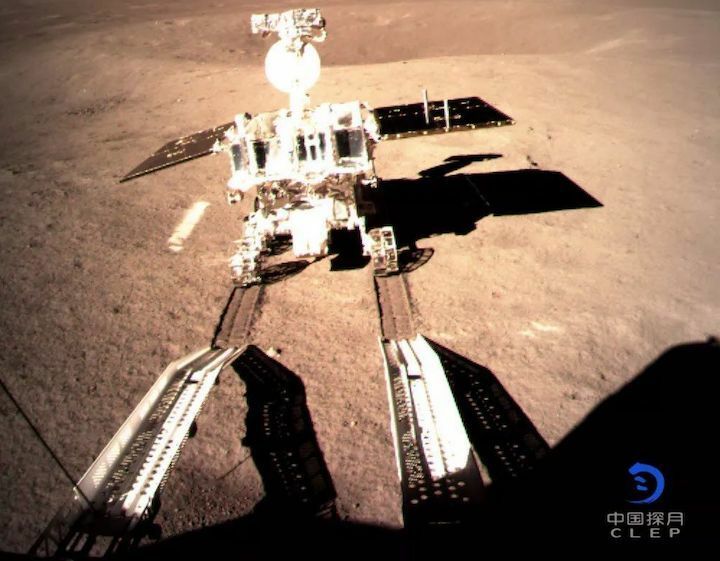 During the Chang'e-3 mission, the ground control center instructed that the rover would remain dormant each night, said Zhang He, executive director of the Chang'e-4 probe project, from CAST. Once the sun would rise, Yutu would wake automatically, but it needed ground control to instruct it to start the work mode, Zhang said. However, Yutu-2 will automatically enter the dormant state according to the level of sunlight, and it can also enter the work state on its own. "We made this adjustment because communication between ground control and the Chang'e-4 probe on the far side of the moon is not as convenient as communication with Chang'e-3 on the near side," said Zhang. China's first lunar rover Yutu suffered a mechanical fault after driving about 114 meters five years ago. "How to solve that problem so that it won't happen again was the main challenge in developing the new rover," said Zhang Yuhua, another deputy chief designer of the probe. "We have improved the layout of the wires on the new rover and taken measures to prevent short circuits. We also made a fault isolation design so that if a problem occurs, it will not affect the whole system," said Sun Zezhou, chief designer of the Chang'e-4 probe. "Compared with Yutu, our second rover is stronger," said Shen Zhenrong, a designer of the rover, from CAST. "We are confident our new rover can run farther on the moon and obtain more scientific results," Sun said. China's Chang'e-4 mission rover mission rover has rolled down from the lander onto the lunar surface following Thursday's historic landing on the far side of the Moon. The Chang'e-4 spacecraft had made its descent from lunar orbit and into the pre-selected landing area with the Von Kármán crater at 02:26 universal time Thursday (10:26 Beijing time). The lander returned the first ever images from the surface of the far side of the morning shortly after, with images from its descent and others cameras sent to Earth via the Queqiao relay satellite. 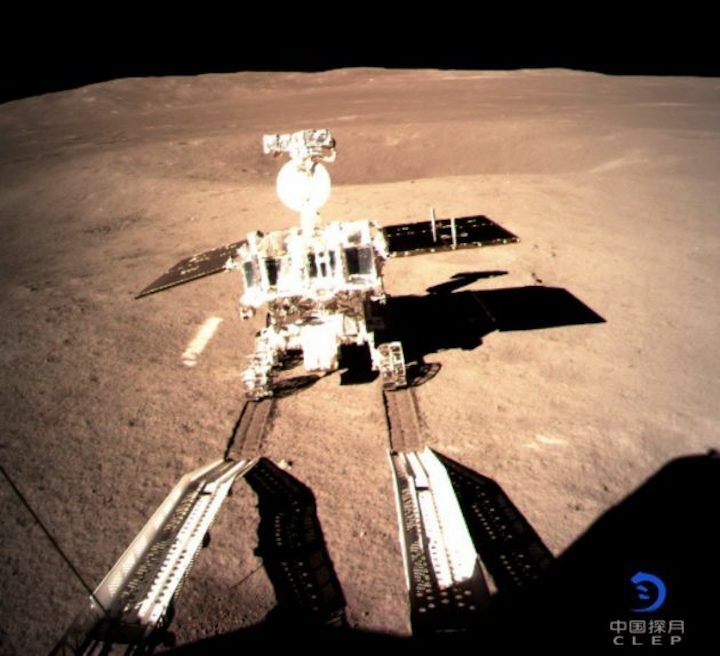 Almost twelve hours later the China Lunar Exploration Project (CLEP) announced that the rover had descended from atop the lander at 14:22 UTC. 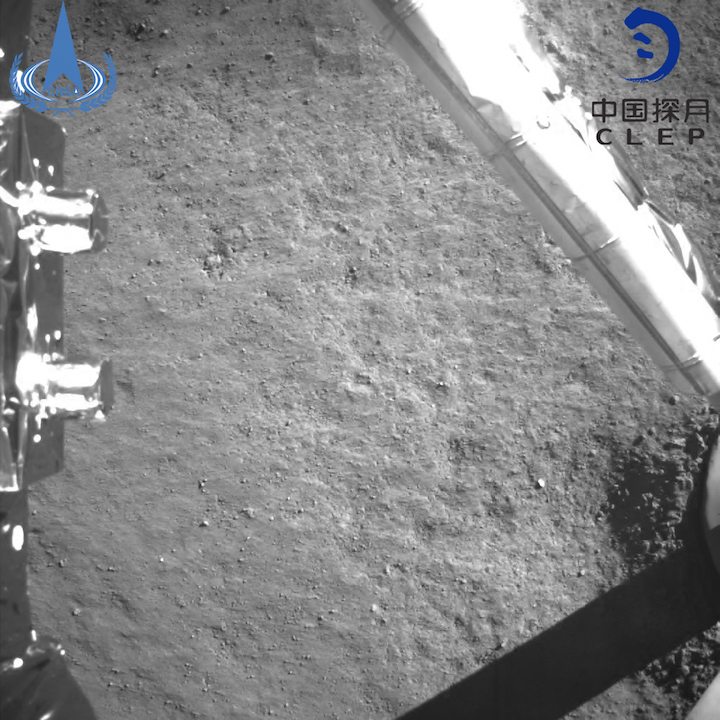 CLEP also revealed that the rover would be named Yutu 2 (Jade Rabbit 2), following on from the rover for the Chang'e-3 mission which landed on Mare Imbrium on the near side of the Moon in December 2013. The name came from a public contest to elicit names, a vote from a shortlist and final decision by committee. 'Brightness' (光明, guangming), 'Wang Shu' (望舒) and 'Stroller' or 'Hiker' (行者, xingzhe) had appeared more popular. China's Chang'e-3 lander and Yutu (Jade Rabbit) rover operating on the Moon after landing in late 2013. Chang'e-4 landed at 177.6 degrees east longitude and 45.5 degrees south following a 12-minute powered descent. Yutu will rove within Von Kármán craterand analyse the variations of composition of the lunar surface the Visible and Near-Infrared Imaging Spectrometer (VNIS), while also returning unprecedented images with a panchromatic camera. The rover's two offer science payloads, the Lunar Penetrating Radar (LPR) and Advanced Small Analyser for Neutrals (ASAN), the latter developed by the Swedish Institute of Space Physics in Kiruna, will provide insight into the lunar subsurface to a potential depths of hundreds of metres and the space environment and interactions with the surface respectively. BEIJING, China's successful landing of Chang'e-4 spacecraft on the dark side of the moon is hailed by astronomers worldwide as a great achievement, and many expect breakthrough findings from the probe. NASA Administrator Jim Bridenstine said on his twitter account Thursday that the landing is "a first for humanity and an impressive accomplishment!" Ian Crawford, professor of planetary science and astrobiology at Birkbeck, University of London, told SpaceNews Magazine based in the United States ahead of the event that a safe landing would be a "fantastic achievement." "This will give valuable information on the composition of the far side crust and, conceivably, the upper mantle ... The radio astronomy experiments are also of great interest, which may lay a foundation for the development of lunar far side radio astronomy," Crawford said. Fred Watson, who promotes Australia's astronomy endeavours as its astronomer-at-large, told BBC that "the Chinese space agency is a young organisation, but perhaps in years to come, it will catch up." 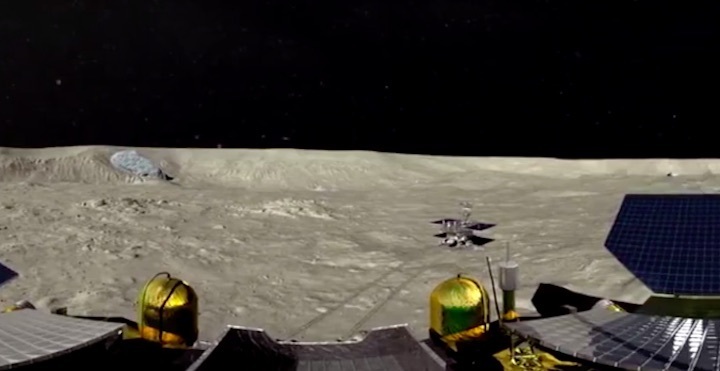 Landing on the unexplored and rugged far side of the moon is not easy, and Chang'e-4 is the first craft that has ever made it. "Landing on the far side of the moon is an amazing technical achievement because there is a significant amount of time when the vehicle is out of contact with earth," said Eugenio Fontan, the Managing Director of the Madrid Aerospace Cluster. "The Chinese probe has had to land on its own. That is something very few space agencies have the capacity to do," he highlighted. The moon is tidally locked to earth, rotating at the same rate that it orbits Earth, so only one side of the moon is seen from Earth, leaving the far side a complete mystery, until now.